To Dog With Love: Positive Reinforcement with Vita Bone Treats and Giveaway! 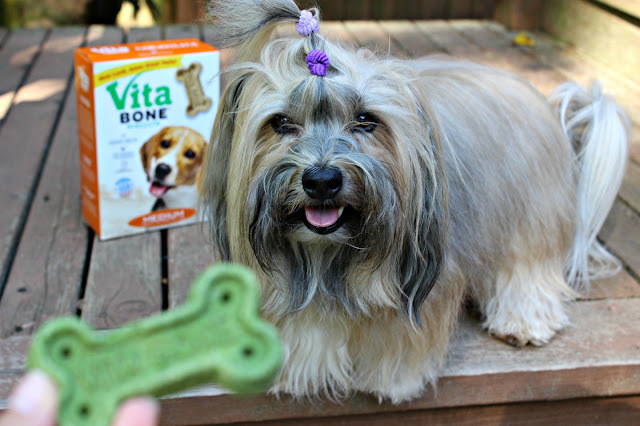 Positive Reinforcement with Vita Bone Treats and Giveaway! Rocco keeps his eye on the prize -- a tasty Vita Bone biscuit! This post is sponsored by Vita Bone. I am being compensated to spread the word about Vita Bone Biscuits and Chewys but we only share information we feel is relevant to our readers. Ever since Rocco was a young pup, we've used positive reinforcement training to help turn him into the fine young dog and athlete he is today! Positive reinforcement is about rewarding your pup when they perform a behavior you want them to do, rather than punishing them for an unwanted behavior. Imagine if all you heard was no-no-no all day. It would probably put you in a bad mood (at a minimum) and likely make you mad at the world! The same thing goes for your pup. Rewarding your pup for a desired behavior goes a long way in increasing the bond and trust between you and your dog and it encourages your dog to exhibit that good behavior again and again. We've trained everything from tricks and agility to good manners using positive reinforcement and we like using rewards like USA-made Vita Bone treats to reward for a job well done! Here are some of our favorite and most useful behaviors we've trained using positive reinforcement. Instead of jumping at kitchen counters, give your pup an acceptable alternative behavior. Rocco is trained to go to his place -- a comfy bed in the corner of the kitchen -- where he can safely observe all the kitchen activity. He gets lots of treats and praise for going to his place. Train a similar behavior for pups who jump on guests at the front door. When the doorbell rings, reward your pet for lying calmly on a cushion near the front door. Practice with a friend -- ringing the doorbell and opening the door -- before real guests come to call! Does your dog bark or lunge at dogs walking by? Keep your dog's eyes on you by holding a tasty treat and saying "watch me". Reward their attention on you. You can add "look at that", pointing to the cause of their barking and then reward a quick head turn back to you. Rocco and his friend Sophie couldn't resist the box of Vita Bones that arrived at our door, dragging the box into the living room and trying to open it while I wasn't looking! Who do you think "did it"! Even good dogs get into mischief! But who could resist a box full of Vita Bones Biscuits and Chewys! Tip: Use a Vita Bone treat to get your pups to focus on you while taking photos. More about Vita Bone and how to win some! Vita Bone Biscuits and Chewys are made in the USA by a family-owned and operated company since 1972. The Biscuits are made with natural ingredients and are fortified with 23 essential vitamins and minerals. Vita Bone Chewy sticks are a softer, meaty treat made with real meat. Rocco loves them both... a LOT! It's easy to break up both the biscuits and the chewys into smaller Rocco-sized training pieces so we've used them recently as rewards at an agility trial and look what happened....! We'll be stocking up on more Vita Bone treats before our next trial! 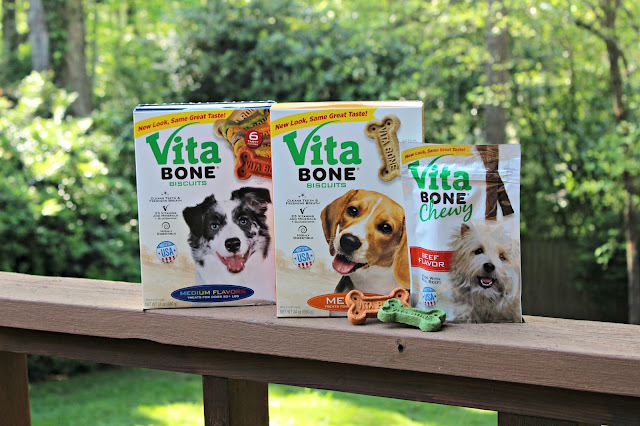 To find Vita Bone near you,use the Vita Bone store locator and then get some coupons for both Vita Bone Biscuits and Chewy Treats. They're currently distributed mostly out west and in the midwest, but I hear they're in the process of expanding their distribution. If you can't wait to try them, you can order now on Amazon and also enter our giveaway below! Enter via the Giveaway widget below for a chance to win a Vita Bone prize pack. We deserve these treats so that we can donate them to our local shelter for pups to enjoy while they wait for their forever homes! Shunta is gettinbg old now but she took care of her mom and dad before they passed away and needed help getting in out especially Kota her dad who couldn't see too good. Shunta deserves all sorts of treats! What a wonderful line of treats. Schooner & Skipper deserve to have Vita Bones because they bring me joy and happiness every single day. They love giving me kisses and hugs. They are always at the door to greet me when I come home. My dogs are FAMILY! My three Boston's, Adrianne, Junebug and Cain deserve these treats because they are wonderful dogs! They are always there for me when I need them. My dog deserves them because he is so sweet and loves me unconditionally. That's as good a reason as any, I think. Thank you. 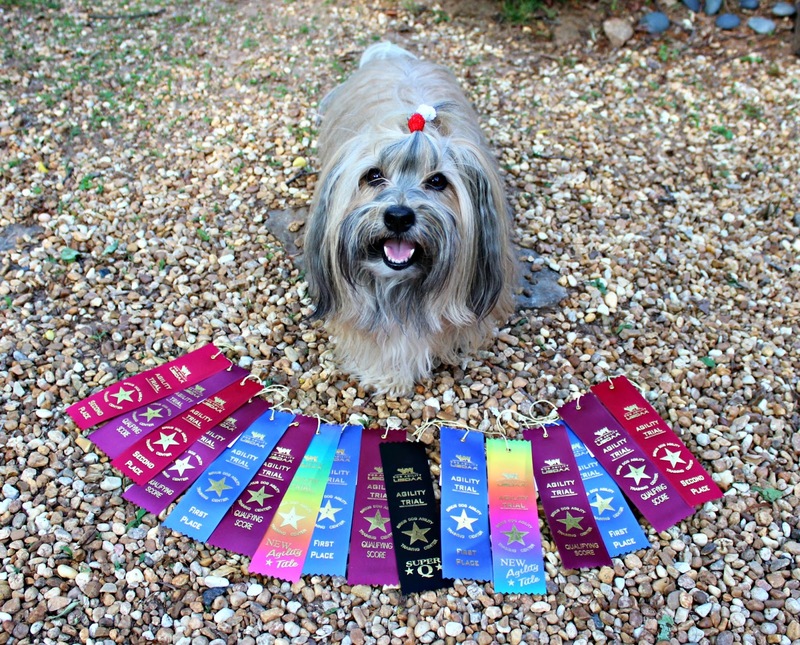 Great tips and congrats again on all your success at agility last weekend. My 4 rescue dogs deserve healthy treats. These would be so handy for training and especially working on focusing. We have 3 black labs, we're on vacation with them right now and they are such good dogs they deserve only the best. My chihuahua is a sweetheart and she deserves the best. My mixed bread Blackie is the best dog around, he love other dogs and people. He shares his toys with visitors and comes after me when something is going on in the area. He deserves the treats. Blue deserves these vita treats because they r packed w vitamins n minerals, n I know he will love!! What a great haul in agility! Congrats! great tips and treats. My dog, Milo, who is my new rescue, deserves every treat that he didn't have back when pwople were not taking proper care of him. My Beagle Bailey is the Social Director at my Doggie Daycare. He puts up with a LOT of K9 visitors in his home so he deserves extra special treats and treatment. Hunter deserves these treats because he is my little buddy that sticks by my side every day! We have not tried these yet. My dog would love some! my 3 gals deserve extra treats for being good. my oldest deserve treats because she has a bad back and a little dementia. she has been my baby for almost 15 yrs. They'd love these because we do a lot of training. They snuggle anytime I want to. My pup deserves it as he is adopted and much loved by all of us. Before that though he was horribly treated by his previous owner and deserves all the good things that come his way. He deserves treats because he is a wonderful dog. He always take care of my wife when she has a migraine. He also loves to go on adventures and never complains about where we go and what we do.